The creator of the Cleanflight, Dominic Clifton, has released the fastest, the most advanced, and the most powerfull flight controller in the market – SP Racing H7 EXTREME. The list of the features of this flight controller is extensive. First of all it runs on F7 MCU with a clock of 400MHz, it has DUAL ICM20602 GYROS, rotated at 45 degrees working simultaneously to provide the best low-noise jitter free gyro output. There is 128Mb dataflash chip to store the code and blackbox data, connected with a super fast bus (QSPI 4bit ). There is also BMP388 barometer present on this board. 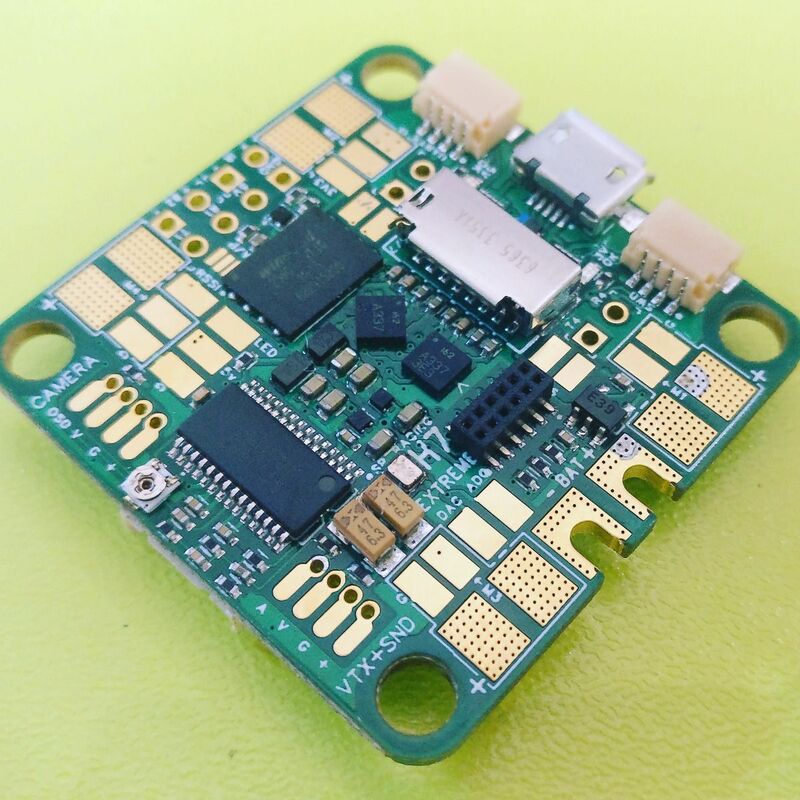 There are outputs for up to 12 motors, 6 serial ports enabling you to connect telemetry receiver, bluetooth, GPS, ESC telemetry and SmartAudio. Unique PID-Audio feature with microphone onboard, that allows you to hear your quad tune (I mean PID tune)! Oh, and the firmware for SPRacing H7 EXTREME can be updated right from the SD card! 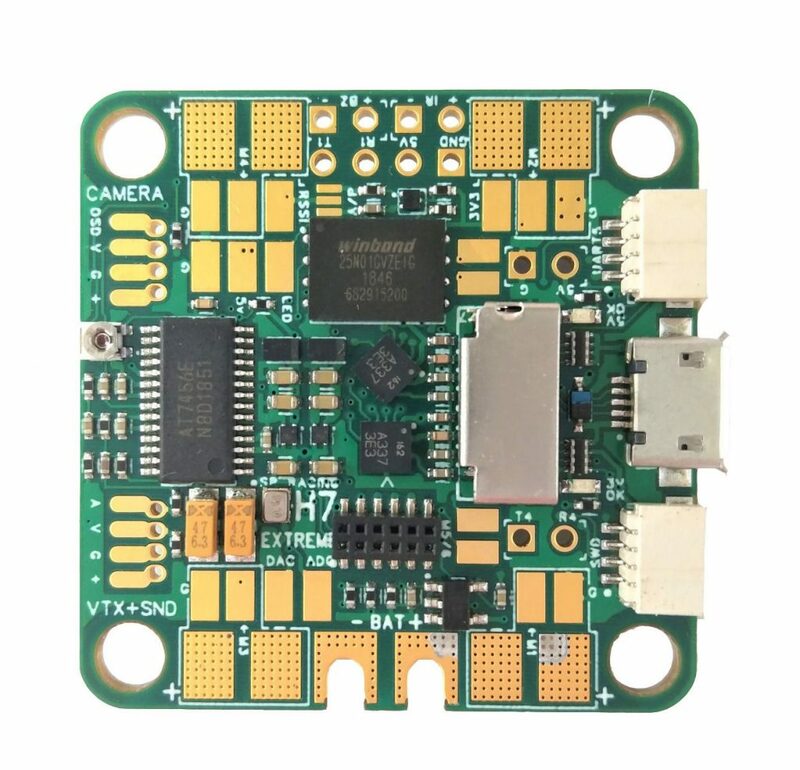 The SPRacing H7 EXTREME flight controller features a 400Mhz H7 CPU that runs twice as fast as the previous generation F7 boards. A fast control-loop is what you need for perfect flight performance, the H7 at 400Mhz gives you all the processing power you need. 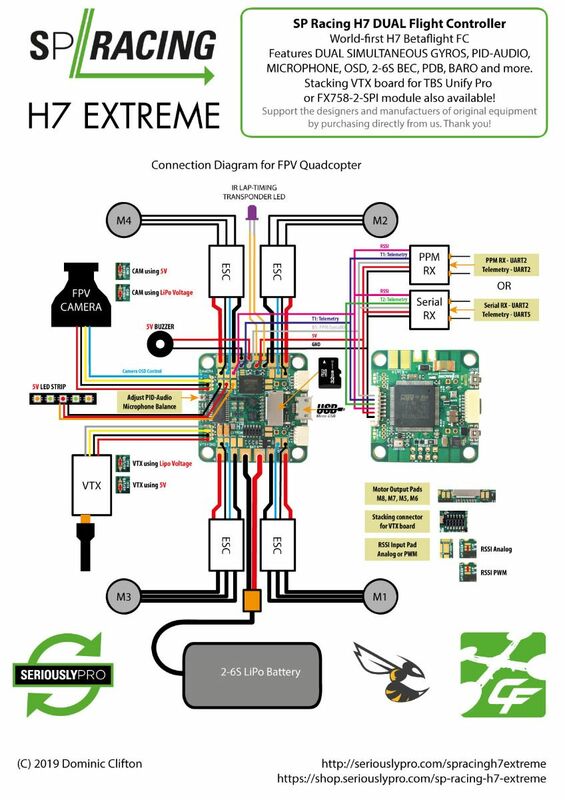 The SPRacing H7 EXTREME has integrated OSD (on-screen-display) and PDB (power distribution board) and features all the latest technologies available. The FC has features not-seen anywhere else as our competitors still can’t keep up with us. Features like PID-Audio with microphone mixer allow you to hear your quad as you fly it, if you can’t hear it you’re flying deaf! Audio feedback from the FC and the on-board microphone is realtime! No-one else has yet implemented SIMULTANEOUS DUAL GYRO which gives you super accurate response even before you even think about adjusting your filter settings. Don’t accept ancient and slow gyro sensors! Simultaneous dual-gyro support already produces low-noise jitter free gyro output, but SP Racing raises the bar again as now the two ICM20602 gyros on the H7 EXTREME are supplied by their own regulator and are supplemented by an additional high-capacity, yet tiny, filter capacitor. Only this gives the gyros the noise-free power supply they need to work at their best. Each gyro has it’s own dedicated SPI bus which allows for parallel data transfers. The FC features two logging choices, both of which are better and faster than seen anywhere else. Either use the onboard 128MB flash chip or use the MicroSD card socket. Both the flash chip and the SD Card are connected directly to the CPU using a separate parallel bus technologies (QSPI 4bit and SDIO 4bit respectively). Other FC’s either have small slow serial flash chips or SPI connected SD Card. Using parallel bus technologies further decreases the load on the already-fast new H7 CPU! Low CPU load = faster response, even with all the peripherals and logging enabled. We don’t just stop with new technology, oh no. SP Racing FC’s are designed with serious thought and consideration for a multitude of users. We take pride in looking at what we can do to design a quality product, not something just slapped together to turn a quick profit. For instance, the red status LED is centrally rear mounted on the _bottom_ of the FC. Why not the top like everyone else? Well when flying the quad is in the sky, and generally above you, so you’ll be able to see it! Especially useful when flying tail-in line-of-sight. We also know that at some point you will crash your flying machine, that’s why this board is a solder-from-top design. All the major connections can be made from the top of the board, which means you don’t have to take much of your frame apart to get to the solder pads which makes replacing a wire easy! It also means when building your model you can cut your wires to the right length for optimum installation. Never wire up an FC with motor pads on the bottom again! What receivers? How many motors? The H7 Extreme has a stupid amount of I/O support. Seriously! It has dedicated support for 12, yes 12 motor outputs. Ok, ok, so 4 of the 12 outputs are only on the stacking connector, but if you’re running 12 motors you’ve got room for an IO stacking board right? Receiver wise, well the SP Racing H7 Extreme has 6 serial ports so you can easily connect a telemetry receiver, bluetooth, gps, ESC telemetry and SmartAudio – told you it was stupid amount! The H7 serial ports are all software invertable, no external inverters or wiring hacks required. All the main serial based receivers and supported and new protocols are constantly being added. If you really wanted to, you could even use old-school PPM or 8 channel PWM receivers, not that we recommend that these days of course. OSD, yep it has the standard character-based OSD you probably already know about. 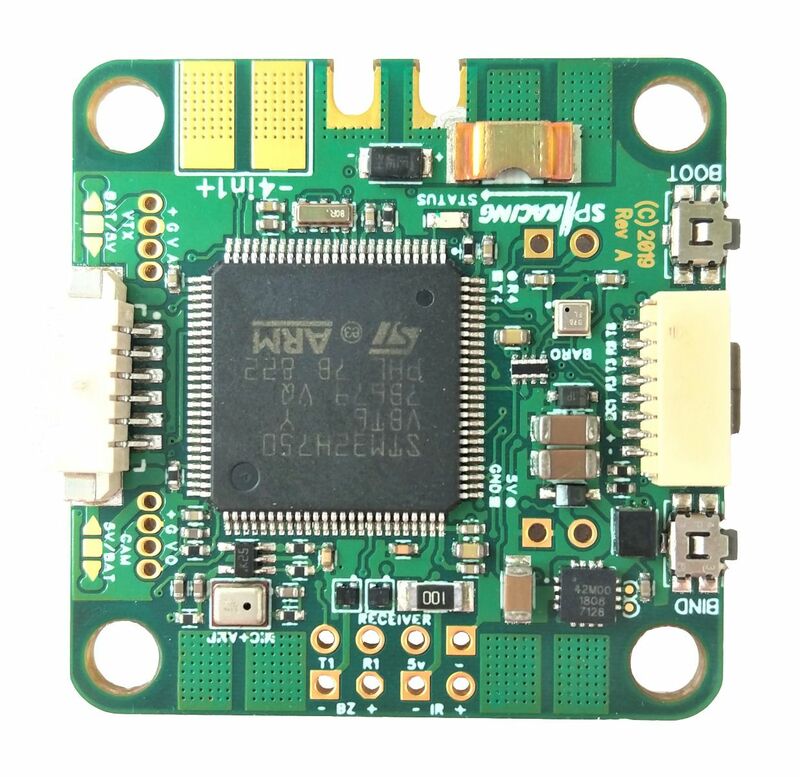 The OSD supports very configurable layouts, gives you all the important data-points you might want to see on-screen, such as battery voltage, consumption, flight time, altitude, pilot-name, etc. There’s also an on-screen configuration menu to let you adjust your settings in the field without a computer. SP Racing was the initial supporter of IR transponder technology for lap-timing. The SP Racing H7 EXTREME of course features support for iLap and other IR receivers. Other flight controllers may advertise iLap support, but try asking them for an iLap code that works, SP Racing supplies them! We did the hardware, we did the software, we know how it works, others just copy things they don’t understand. Yes yes, we know that many people use RF based timing solutions these days, however high-frequency IR solutions are more accurate when it counts and are not affected by dodgy VTX boards. We give you the choice, you decide what works for your racing event. Also, the H7 EXTREME features a new smaller low-profile MOSFET for full high-frequency IR support. On-board VTX? No, not with the size of the H7 CPU!, but that’s OK as the H7 extreme features the same stacking connector system as the F7 DUAL so the Stacking VTX board still fits! Yes, direct-solder your TBS Unify Pro or FX768-2-SPI module to the stacking-board and enjoy an FC+OSD+PDB+VTX stack that’s just 15mm tall! Don’t want to stack? No problem just connect your VTX using the special solder pads or picoblade connector instead. When using the Stacking VTX board the VTX can be turned off from your transmitter (pit-mode), great in team or relay races! Also, if you’re using the FX758-2-SPI module or a VTX with SmartAudio or other communication system you can hook that up to the FC and use the OSD to configure your VTX’s settings, like power output, channel, etc. Camera? Connect your FPV camera to the camera port to allow the OSD image to be overlaid onto your FPV video stream. The camera port (solder pads or picoblade connector) also has Camera OSD control to allow the camera’s own OSD menu to be controlled via your transmitter sticks so you can adjust your camera to suit the lighting conditions of your flying zone. Audio? We mentioned the PID audio briefly above, but let’s talk details. PID-Audio lets your hear how hard the FC is working to stabilise the model, you can choose which axis to listen to, or none, by using a rotary dial or switch on your TX. The audio signal generated by the FC is a tone that changes based on the PID error. The more unstable (more error) the more the tone changes, the less error the more constant the tone becomes. Plus it’s just cool to hear it too! In addition to PID-Audio there is an on-board downwards-facing microphone. It’s downwards facing so that you can actually hear the motors, instead of just wind-noise which is all you generally get from an FPV camera with built-in mic. When you can hear the motors you can fly better, period. We know a bunch of top-pilots who always listen to their quad when racing and fly better because of it. You can adjust the balance between the FC PID-Audio output and the microphone by using the on-board trimmer-pot. The volume is adjusted using your headphones/goggles/screen.